Most eminent of the Christian theological philosophers of the Middle Ages; born 1227 at Aquino, kingdom of Naples; died 1274. Like his teacher Albertus Magnus, Thomas made philosophy his favorite study, and sought to harmonize it with religion. "All knowledge of principles, naturally possessed by us," he said, "comes from God, since God is the author of our nature. The divine wisdom possesses these principles in itself; therefore all that contradicts them is incontradiction to the divine wisdom and can not proceed from God" ("Contra Gentiles," i. 7). Although, as a Dominican friar, Aquinas was not animated by kindly feelings toward the Jews (see Guttmann, "Das Verhältniss des Thomas von Aquino zum Judenthum und zur Jüdischen Literatur," pp. 3 et seq. ; Geyraud, "L'Antisémitisme et St. Thomas d'Aquin," pp. 40 et seq. ), he did not disdain to draw upon Jewish philosophical sources. His main work, "Summa Theologiæ," betrays a profound knowledge not only of the writings of Avicebron (Ibn Gabirol), whose name he mentions, but of all Jewish philosophical works then existing. His theodicy is modeled after that of the Jewish philosophers, and his arguments can easily be referred to Jewish sources. Thus he gives five proofs of the existence of God, three of which are directly taken from Jewish philosophers. The first runs as follows: "It is clear that there are in this world things which are moved. Now, every object which is moved receives that movement from another. If the motor is itself moved, there must be another motor moving it, and after that yet another, and so on. But it is impossible to go on indefinitely, for then there would be no first motor at all, and consequently no movement" ("Contra Gentiles," ii. 33). This proof is evidently taken from Maimonides, whose seventeenth proposition reads: "All that which is moved has necessarily a motor" ("Moreh," ii. 16). Second proof: "We discern in all sensible things a certain chain of efficient causes. We find, however, nothing which is its own efficient cause, for that cause would then be anterior to itself. On the other side, it is impossible to ascend from cause to cause indefinitely in the series of efficient causes. . . . There must therefore exist one self-sufficient, efficient cause, and that is God" ("Contra Gent." i. 22). To this proof two Jewish sources seem to have contributed: BaḦya's "Duties of the Heart" (chapter on "Unity," 5) and Maimonides' "Moreh" (6th proposition, "Moreh," ii. 16). The third proof runs: "We find in nature things which may be and may not be, since there are some who are born and others who die; they consequently can exist or not exist. But it is impossible that such things should live for ever, for there is nothing which may be as well as not be at one time. Thus if all beings need not have existed, there must have been a time in which nothing existed. But, in that case, nothing would exist now; for that which does not exist can not receive life but from one who exists; . . . there must therefore be in nature a necessarily existent being." This proof is based on Avicenna's doctrine of a necessary and possible being, and is expounded by Maimonides, from whom it is probably taken (see "Moreh," ii. 19). In order to demonstrate God's creative power, Thomas says: "If a being participates, to a certain degree, in an 'accident,' this accidental property must have been communicated to it by a cause which possesses it essentially. Thus iron becomes incandescent by the action of fire. Now, God is His own power which subsists by itself. The being which subsists by itself is necessarily one" ("Summa Theol." i. 44, art. 1). The idea is expounded more clearly by BaḦya in his "Duties of the Heart." He says: "It is evident that all which exists in a thing as an accident must be received by the thing which has the accidental property only from one which already possesses it essentially, just as we see that the heat of the boiling water is communicated to it by the fire, of which this heat is an essential. . . . And in the same way we may prove the unity of God. Since the unity which occurs in every creature is accidental (not essential), as we have demonstrated, it must be derived from the essence of the efficient cause of all creatures" ("Duties of the Heart," on "Unity," 9). Thomas pronounces himself energetically against the hypothesis of the eternity of the world. But as this theory is attributed to Aristotle, he seeks to demonstrate that the latter did not express himself categorically on this subject. "The argument," said he, "which Aristotle presents to support this thesis is not properly called a demonstration, but is only a reply to the theories of those ancients who supposed that this world had a beginning and who gave only impossible proofs. There are three reasons for believing that Aristotle himself attached only a relative value to this reasoning. . . ." ("Summa Theologiæ," i. 45, art. 1). In this Thomas copies word for word Maimonides' "Moreh," where those reasons are given (i. 2, 15). 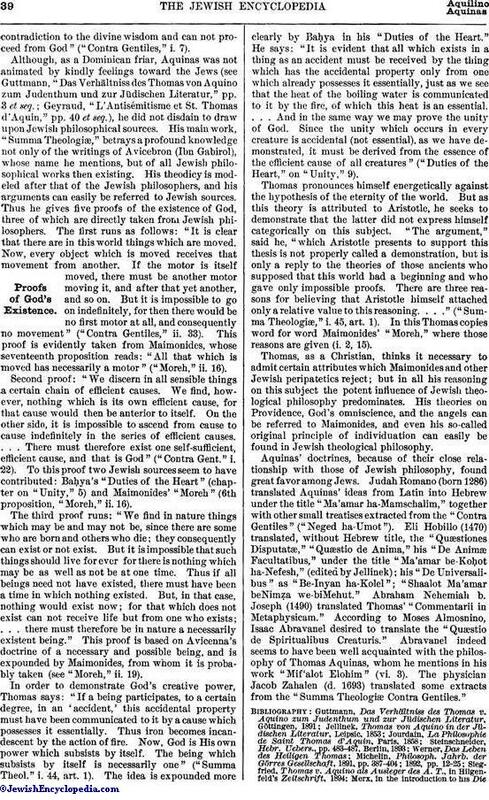 Thomas, as a Christian, thinks it necessary to admit certain attributes which Maimonides and other Jewish peripatetics reject; but in all his reasoning on this subject the potent influence of Jewish theological philosophy predominates. His theories on Providence, God's omniscience, and the angels can be referred to Maimonides, and even his so-called original principle of individuation can easily be found in Jewish theological philosophy. 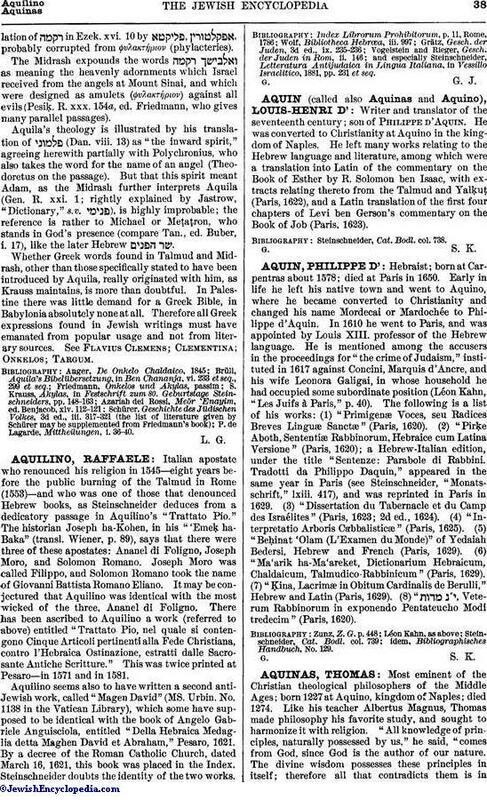 Aquinas' doctrines, because of their close relationship with those of Jewish philosophy, found great favor among Jews. Judah Romano (born 1286) translated Aquinas' ideas from Latin into Hebrew under the title "Ma'amar ha-Mamschalim," together with other small treatises extracted from the "Contra Gentiles" ("Neged ha-Umot"). 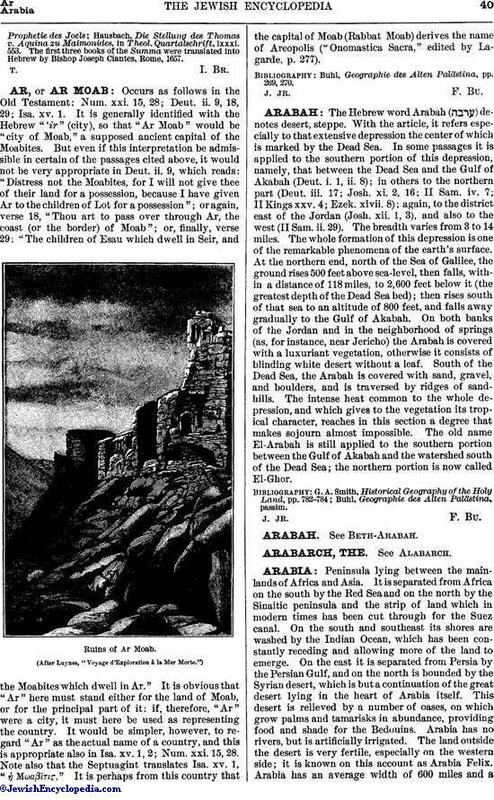 Eli Hobillo (1470) translated, without Hebrew title, the "Quæstiones Disputatæ," "Quæstio de Anima," his "De Animæ Facultatibus," under the title "Ma'amar be-KoḦot ha-Nefesh," (edited by Jellinek); his "De Universalibus" as "Be-Inyan ha-Kolel"; "Shaalot Ma'amar beNimẓa we-biMehut." Abraham Nehemiah b. Joseph (1490) translated Thomas' "Commentarii in Metaphysicam." According to Moses Almosnino, Isaac Abravanel desired to translate the "Quæstio de Spiritualibus Creaturis." Abravanel indeed seems to have been well acquainted with the philosophy of Thomas Aquinas, whom he mentions in his work "Mif'alot Elohim" (vi. 3). The physician Jacob Zahalen (d. 1693) translated some extracts from the "Summa Theologiæ Contra Gentiles." Steinschneider, Hebr. Uebers., pp. 483-487, Berlin, 1893. Hausbach, Die Stellung des Thomas v. Aquina zu Maimonides, in Theol. Quartalschrift, lxxxi. 553. The first three books of the Summa were translated into Hebrew by Bishop Joseph Ciantes, Rome, 1657.